The media these days is full of references to osteoporosis, and how diet, exercise, and some medications can help battle this condition. Osteoporosis is characterized by a loss of bone density, leaving bones weak and at increased risk of breaking. One of the most common complications of osteoporosis is vertebral compression fractures, affecting hundreds of thousands of people every year in the United States. Many people do not even realize they have a compression fracture and do not seek medical care because they assume their symptoms are simply part of the aging process. For others, compression fractures can be very painful. Whether painful or not, compression fractures can lead to additional fractures, spinal deformity, and loss of the ability to function. The spinal column consists of 34 individual bones called vertebrae. Separating the vertebrae from each other are intervertebral discs that cushion and absorb the stress and shock that the body incurs during movement and give the spine its flexibility. 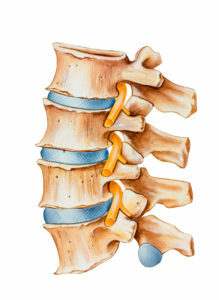 Compression fractures occur when the vertebrae collapse, decreasing the space between them. These injuries often happen to people with osteoporosis and can be the result of a minor fall or even simple daily activities such as bending or lifting. Most cases of compression fractures can be treated using medications to relive pain, bed rest, and the use of a back brace. The brace helps relieve pain by immobilizing the fracture and reducing the height loss that occurs as a result of the compression. The brace is discontinued when x-rays show no change in the position of the vertebrae and healing of the fracture. In rare instances, severe compression fractures may require a surgical procedure in which special spinal hardware, such as hooks, rods, plates, or screws are used to help fuse the vertebrae together to increase stability and prevent further injury. Recovery from this type of surgery can take several months. We offer two minimally invasive techniques to treat compression fractures called vertebroplasty and kyphoplasty. In these procedures, orthopedic cement is used to “rebuild” the vertebral space and return it to its original height. These procedures not only restore height and relieve pain, they can also prevent future fractures by strengthening other vertebral bodies that are weakened but not yet fractured. Most patients experience immediate pain relief after the procedure and are quickly able to return to their daily living activities. The best way to prevent osteoporosis and compression fractures is to keep your bones strong by adopting a healthy lifestyle that includes a well-balanced diet rich in calcium and vitamin D, regular exercise, and avoiding unhealthy activities such as smoking and excessive use of alcohol. If you have osteoporosis and have experienced any of the symptoms discussed above, talk to one of our physicians. We can evaluate your condition and, together, develop a treatment plan that can help you return to a healthy, pain-free life.